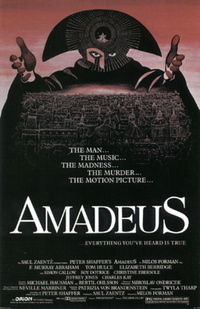 Amadeus is the story of the last ten years of Wolfgang Amadeus Mozart’s life told by Director Milos Forman. The main story is about the conflict between a genius’ need for fun and a society that disgraces that type of thing. A spectacular picture about one of the most gifted composers of all times with memorable acting by Tom Hulce who played Mozart.